I was stunned. I couldn’t believe that was all he could say, so my response was less than articulate. I said, “well it’s f***ing offensive if you ask me.” He said “how was it offensive?” and I said that there is thing called genocide and it looks to me like your shirts are celebrating dead Indians. This almost led to a confrontation outside the store:The owner-guy said that I was the one who was offensive when I brought up the word “genocide.” I said, “I’m not sure how else to take your shirts, because genocide is a major part of our state’s history, and your shirts send a confusing message.” He went on then to say, “well some of us are native and we wouldn’t offend our own people.” He then went on to challenge my ethnic identity saying “you don’t look Indian at all to me.” I told him, well I am part native but that’s not really the point here. He reiterated his point about “not standing on the graves of his fathers and grandfathers to offend my own people.” (I think he also invoked his privileged status as having a CDIB card, something that many Indians in Oklahoma do not have due to the decision of their native ancestors to not cooperate with government agents who compiled the Dawes Roll and other rolls in the late 1800s. )Branum explains why the shirt is wrong:I first think about the famous line, “the only good Indian is a dead Indian,” (a quote sometimes attributed to General Sheridan, but more likely a paraphrase from a line out of Congressional floor speech of Congressman James M. Cavanaugh from 1868) and the way our society in past generations honored the “noble savage” who either died off or was assimilated into white society, but refused to give any honor to real live Indians in the present day who resisted both death and assimilation. Or to say it another way, if you want to honor native Americans, why not make a shirt of a hero from our history, or even show the face of someone alive today (who is resisting genocide, simply by living out native values and culture)? 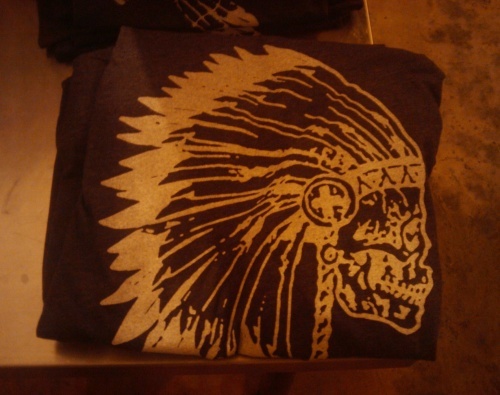 Why is it that only dead Indians, and abstract/stereotypical Indians who get celebrated?And:I also would like to know if the folks at War Paint Clothing Co. plan to come out with other clothing lines, to “honor” other people who were the victims of genocide? Maybe they can make shirts showing holocaust victims eviscerated by starvation and showing their numbers tattooed on their body. Or maybe they could make shirts showing the skulls of dead Cambodians, or maybe poke fun at machetes (the main weapon used in the Rwandan genocide). 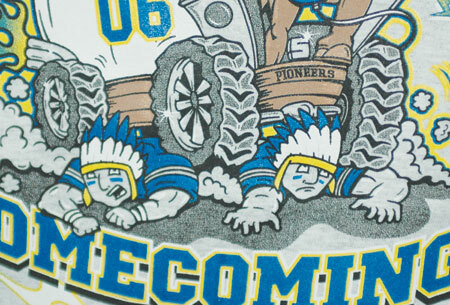 Seriously, why is it ok to make shirts that “honor” American Indian dead in this kind of way, but not ok to do that to do this to other ethnic groups? The only answer is racism. It may be under the surface, but it is still there. Racism says that Indians are different: that we don’t count, that you can display our skulls in museums and put our skulls on funny t-shirts, that you can take our sacred religious objects and use them for satirical purposes. You can even make funny mascots out of us and use them to name your sporting teams. A commenter makes a point:I think there is another way to take that shirt. It reminds me of an anti-war poster showing the skull of a soldier with a helmet on reminding people that war is terrible and men and woman are dying. I don’t know if it was the artists intention or not but it could be taken as a reminder of the genocide; a shirt to wear to remind people of something so easily forgotten. This also makes that photo with the American flag in the background much more meaningful. It reinforces the message that American did this to the Indians and I’m going to remember it and remind people by wearing this shirt. If it said “remember” or “never forget” below the image I might even buy it.To which Branum responds:Good point Aaron. I probably still would have been uncomfortable with it, but probably would have found it more understandable if they had explained the shirt in that way. But to leave it in some kind of vague “we’re honoring our native heritage” way doesn’t have the vibe of remembrance or honor. It feels more like they are using the imagery of the past with Indians in the abstract (i.e. the Buffalo head nickel) rather than celebrating specific Indians (i.e. the Sacagawea coin). You can’t tell if they are trying to be ironic or just trying to cash in on their hipster cliche coolness.Comment: Let's note that the use of a Plains chief has little to do with Oklahoma's Indians. It's stereotypical regardless of the makers' intent. At best the owner is guilty of "honoring" his heritage by reinforcing the idea that Plains Indians represent all Indians. That tribes don't have distinct cultures, or any culture at all except feathers. Some honor. I thought of Aaron's alternative interpretation also. I suspect he may be right. But Branum's rejoinder is on point. If the owner intended to make a statement about genocide, his "honoring his heritage" explanation fails. If he intended to send a clear and compelling message, he really failed. A shirt that says "never forget the American holocaust" to Indians and "the only good Indian is a dead Indian" to racists is a colossal design failure. The shirt reminds me of the cover to THE FOURTH HORSEMAN #1 comic book. 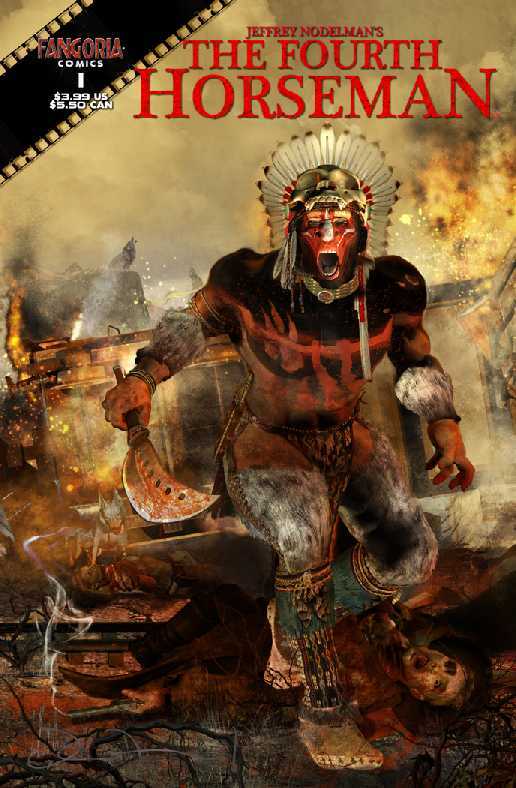 As you may recall, this Indian was the ultimate savage: an unstoppable killing machine. This may be the shirt's message also: that Indians were as deadly as the Grim Reaper. That they were Death personified. Again, this is an insulting, ugly, and stereotypical message. So two of three possible meanings are negative and the shirt's maker doesn't get any of them. Colossal design failure. Branum asks what we can do about this shirt. I believe AIM got a Tribal Impressions store in Texas to take down some of its stereotypical images. How? By writing to them, explaining the problem, and perhaps threatening to protest outside the store. Something similar would work in this and similar cases. First, tell them why they're wrong in writing. Post your explanation on websites, blogs, and social-media sites such as Facebook. Let the owners know they're getting bad publicity. Tell them things will only get worse unless they remove the shirt. That should be enough to garner a response. For more offensive shirts, see "Hanging" Louis Riel T-Shirts Offend Metís, Lucky Brand Sells "White Lightning" T-Shirt, and "Drunk Indian" T-Shirts Aren't Stereotypical? In response to the Tea Pottiers membership Tee. I think one underlying reason for them to take down the shirt, is probably based upon the fact that Natives for the vast majority, DO NOT support tea party events or their causes. Not a single Native organization, tribe or First Nations. Sure, as DMarks would love to believe, some *individuals* do, but realistically, Natives who do support them are just needles in the haystack, very few if any but woefully insignificant. Or you can say that the Natives who are purportly for them are the 0.1%ers of that crowd. Probably the self described Injuns who are only 1/16th of an actualy Indian. Or the ignorant gullible "half Indian", like the owner of that store in this article, who don't know hoot about Indians in general or its given history. And yeah, that membership shirt will make them look laughable or better yet--just plain stupid. The joke would be on them. Because the questions would be asked of them on what specific tribes or First Nations or any authentic Native organizations are supporting them as Tea Potteirs? They couldn't give an answer if that were to happen. Such whacky loons they are. Thanks for talking about this on your blog. Thus far we are having some really interesting conversation about it, but the owner of the store is getting very defensive. Says he is going to talk to his lawyer about what I've said!